When I heard that there was such a thing as paleo marshmallows, I just about did cartwheels. If there is a more comforting, childhood-memory inducing food out there, I haven't found it yet. Marshmallows bring me back to snuggling around the campfire, where I spent many evenings with my family in Leakey, Texas, as a girl scout, and in high school with my friends in my boyfriend's backyard. Then, of course, where there are marshmallows, there must also be... graham crackers. When I was pregnant with my son, I had horrible restless leg syndrome. I could not get to sleep at night until I had a half a sleeve of graham crackers and a giant glass of chocolate milk. I needed those darn graham crackers and the routine became near and dear to me. 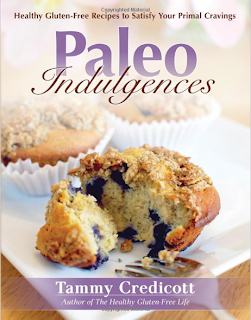 Tammy Credicot has spectacularly brought these fond memories back to me in paleo form in her new cookbook, Paleo Indulgences. From pancakes to candy, these paleo treats will leave you satisfied and wanting for nothing. Could this come at a better time? I know you still have your kid's Halloween candy stashed in your pantry, taunting you every moment you walk past. Or maybe your neighbors and coworkers have already bombarded you with treats for the holidays. Step away from the candy bucket and pick up a copy of this book instead. There are also recipes for paleo crackers, which I'll defnitely be making for my baked brie (shhh I know.. dairy) at Christmas time. Bonus? This book would make a GREAT Christmas gift. The first recipes I tested in this book were the pancakes. The first were the gingerbread pancakes and the second were the banana-pecan. They were tied for the best paleo pancakes I've ever had. Both passed the little boy pancake connoisseur approval test. I think the pancakes are not only delicious, but versatile. While making the banana pecan pancakes, I ran out of bananas, so substituted mashed acorn squash. It was perfect! I have a confession. I have had this book for a few weeks now and have failed to post this fast enough. My excuse: I have been too busy making Paleo pancakes. My boys ask for them at least twice a week. We had them last night for dinner and this morning for breakfast. I made the marshmallows almost immediately. They were not hard and were unbelievably delicious. If only I had taken a picture before devouring every single one of them. I did, however use the recipe as a topping on my sweet potato pie at thanksgiving. I simply made the recipe, but instead of cutting the marshmallows into squares, I smeared it on top of my pie and lightly broiled the top in the oven. Then I sprinkled the whole thing with Maple Cinnamon Pecans. You could do this with any pie or casserole for Christmas. I am definitely doing that again! I have to mention that not only are the recipes in this book innovative and well executed, but the photography is stunning. I can't say I am surprised as, it turns out, Tammy's husband, Cain, runs the one and only Paleo Magazine. It inspired me to put down my point and shoot and pick up my ever-intimidating DSLR. From here on out, my photos will aspire to as beautiful as the ones in Paleo Indulgences. Tammy has generously offered to give a copy of her book to one lucky reader. How can you enter? Leave me a comment below telling me what non-paleo treat you wish you could eat right now! There is probably a paleo version of it in Tammy's awesome book! I'll select a random winner at the end of the contest. Make sure your email is included in the comment form or in the comment itself. Contest ends Friday, December 14 at 10:00am (central). These look oh so yummy.. my favorite non-paleo treat is a patty melt and onion rings from Whataburger. I know that is more like a meal and not sweet, but it certainly ain't paleo! Mmmmm gingerbread pancakes are just in time for the holidays! There are a ton of savoury things that I wish I could 'paleo-ize'. But something sweet that I just can't figure out would be Peanut Brittle. How's that for a challenge!! Mmmm, a slice of yummy lemon tart would make me feel better right now. I've been stressing over writing an assignment and had just a little too much dark chocolate to compensate. Emotional eating is not good. Regular pizza! Nothing I've tried so far has even come close! I've been trying to think of something sweet but I think I'm definitely going to have to go with just regular plain old homemade mac and cheese. Living in the south it is EVERYWHERE!! So not fair, haha. Souffle, either chocolate or a savory cheeselike one. I'd love to have the book. You've made me hungry for pancakes. Thanks for the giveaway! I would love to eat puppy chow and cookies! I LOVE the macadamia/caramel chocolates from Costco... and then a decadent chocolate cake. I love pecan pie or anything with pecans in it! I had weight-loss surgery over the summer and I have been following a mostly paleo diet. I only eat a protein and some veggies. Breakfast has become challenging, but I am glad I found your blog for some new ideas! The weight is coming off, but the band is a tool and not a magic wand. I still have to make good food choices. Cheesecake. My boyfriend makes the best one ever but it's definitely not paleo...or even clean eating for that matter. We cheat once a year for my birthday when he makes it for me. My husband and I have a hard time keeping weight on. In the past, cookies and muffin snacks helped up a lot. He has recently discovered a nut allergy and I am at a loss as to how to make high calorie snacks without grains or nuts.